ITA3219. 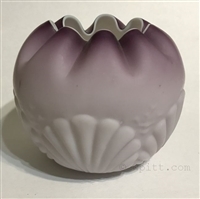 Murano Diamond-Quilted Mother of Pearl Satin Glass egg-shaped paperweight with a pink matte finish. Retains the original paper label "Vetro Artistico Veneziano". Excellent condition. 3 3/4" tall. 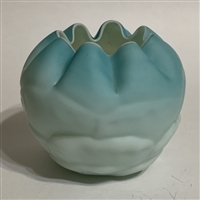 MOP Herringbone pattern satin glass rose bowl in blue shading to pale blue with a white cased lining. 4 ¼" diameter, 3 ½" tall. Beautiful and rare Victorian M.O.P. satin glass large basket. The interior is a deep solid rose color with a pattern of large rain drops, sometimes called "Muslin". Applied clear frosted edge, and frosted thorn loop handle. White exterior. 9 1/2" tall by 9" wide by 10 3/4" long. Excellent condition. SAT740. 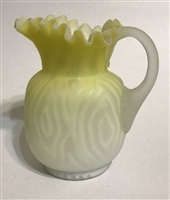 Victorian Moire pattern Mother of Pearl Satin glass creamer with yellow coloring shading to white. Creamy white lining and applied clear frosted handle. Heavily ruffled triangular shaped spout. Polished pontil. Matte finish. 5 ½” tall, excellent condition. Mt. 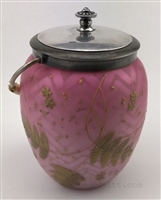 Washington Herringbone Mother of Pearl Satin glass Cracker jar with gold enamel decoration of ferns and flower blossoms. Original metal silver-plated hardware. Retains Brookside paper label. It has an in-the-making flaw (shown), but undamaged. 10" to top of bail. Mt. 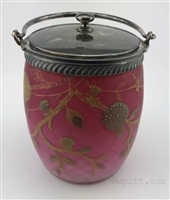 Washington pink satin glass diamond-quilted cracker jar with gold enameling of flower blossoms, leaves and branches. Original silver plated metal and retains paper labels on lid and base of Maude B. Feld. It also has the numbers "667/4 P102" on the base. Excellent condition.